Lighting giant Philips has added aquarium LEDs to its product range, and with the CoralCare system, it looks like it means business, says Dave Wolfenden. Philips’ Electronic Engineer Luc Vogels has led the development of its new CoralCare luminaire over three years with tests courtesy of Coral Publications’ Tim Wijgerde and trials on a number of coral systems, so the company can’t be accused of skimping on R&D. The upshot of research commissioned by Philips appears to be that the CoralCare luminaire supports comparable coral growth to T5 lighting, with improved (up to 30%) efficiency. In looks, the new luminaire has a metallic grey finish and the feel of a repurposed industrial light fitting. There’s a good reason for that — the housing is derived from one of Philips’ models of warehouse light; as a result, some folks find the look a bit of a turn-off. Each to their own, but I liked its no-nonsense, rugged and unfussy appearance. Build quality is outstanding, and very confidence-inspiring. The luminaire has a two-year guarantee, but it looks like it’ll last forever. A 25,000 hour lifespan is claimed for the LEDs; this is running them at the full available power (actually, the LEDs are never driven at anywhere near maximum capacity, helping to ensure longevity). Run them at a reduced power level from the available maximum, and that lifespan will increase further. At full power, expect to draw around 190W. There’s a generous 3m power cable. Measuring 450 x 350 x 130mm high, it’s a brute. The main thing that struck me about the unit was its sheer mass — at 10kg, you’ll need to make sure it’s safely mounted. A hanging kit is included, featuring hefty-looking steel cables and snap hooks which look like they’d suspend a baby elephant. The height of the fitting is easily adjusted with the supplied locking brakes. Wherever you’re hanging it, just ensure it’s going into ceiling joists or structures that can take the weight. That weight is largely down to the huge amount of metal used in the construction. There are 104 LEDs in total, in a 13 x 8 array. This comprises five LED types, all from Philips’ Lumiled brand: l 40 x Luxeon TX 6500K/70 l 32 x Luxeon T Royal Blue l 16 x Luxeon UV 420nm l 8 x Luxeon Rebel Cyan l 8 x Luxeon Rebel Phosphor Converted Amber They really are top quality LEDs, and expensive to buy. Philips states that these are subject to a custom ‘kitting’ and ‘binning’ process. Individual LEDs can vary in their characteristics (even if they’re manufactured identically), and binning involves sorting them into groups (bins) with similar characteristics — a quality control process that ensures consistency. Kitting involves the placing and grouping of LEDs from different colour bins in points on the luminaire which will achieve homogenous light distribution and colour temperature. Rather than using clear glass, the light guard has an almost frosted, hazy appearance. This looked a little odd at first, but it’s apparently designed to reduce light scattering outside the aquarium which can create distracting caustics (glitter lines) where we don’t want them — i.e. on the floor around the tank. The light guard assists with creating a pleasingly blended light output, avoiding the ‘disco effect’, where individual LEDs on the luminaire create noticeable, distinct points of light in the aquarium, which can look very unnatural. Switch it on, and it’s certainly bright, and capable of belting out PAR values suitable for light-hungry SPS corals. Aesthetically, the light has a very even appearance (perhaps Philips are really onto something with the light guard). The spread is, frankly, amazing; self-shadowing of corals is minimal to non-existent, and I’d imagine this would only be a problem for larger plating colonies. Coverage of up to 100 x 80cm is suggested for a 90cm deep tank, but this will vary according to the animals’ lighting needs and the layout; for undemanding species and with optimal positioning, you could well get away with more coverage than this. The overall effect is very similar to T5 lighting, but perhaps a touch more dynamic. It’s maybe a little flat for some tastes but in spite of it not being a full-on point source of light, it is possible to create shimmery glitter lines with sufficient surface water movement. Thanks to the lack of active cooling, the unit is IP65 rated, so it’s well protected from salt ingress and the occasional water splash. You can run the CoralCare luminaire as a standalone unit, but then you’re not making the most of its inherent controllability. Many of us will want to start tweaking settings and devising custom schedules. You’ll need the CoralCare Controller which uses the 3m long low-voltage cable leaving the unit from a gland on the upper side. Some will berate the lack of native Wi-Fi connectivity, but it is what it is. Rather than allowing individual control of each of the five LED types, Philips has simplified the programming process by grouping the LEDs into just two channels. Channel 1 (blue) is made up of the T Royal Blue and UV 420nm LEDs; Channel 2 (white) is made up of TX 6500K/70, Rebel Cyan and Rebel Phosphor Converted Amber LEDs. By driving the channels at varying power, the unit will produce colour temperatures from 6500°K to a deep blue. While some programmable aquarium LED lighting allows for the creation of custom settings to rival the lightshow at a Sisters of Mercy gig, it’s far simpler with CoralCare; don’t expect big effects like passing cloud cover or lightning simulation. When programming, altering the lighting’s parameters involves simply selecting how the blue and white channels are driven (thereby changing the colour temperature and overall intensity). Philips suggests that this simplified approach offers control over the lighting in a practical manner, while ensuring the quality of light is consistently maintained; this reduces the risk of coral health and growth being compromised by the selection of inappropriate LED combinations by the user. 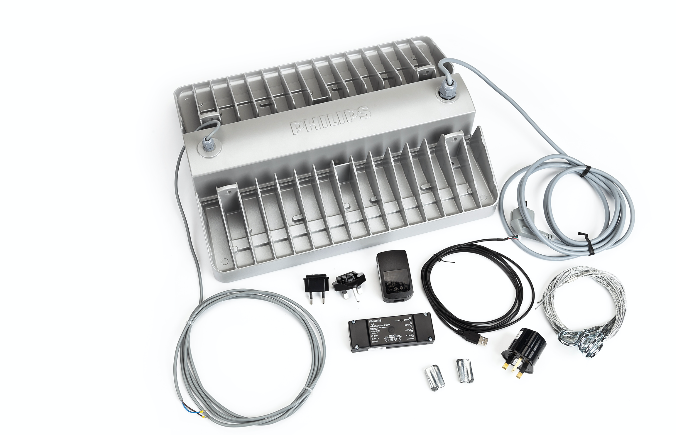 Available as an optional accessory, the CoralCare Controller is a dinky black box, which connects to the luminaire and runs a custom lighting schedule. Setting up involves a little light screwdriver work, and you’ll currently need a Windows computer to use the CoralCare software. (Philips confirmed that Mac support is in the pipeline but there is no definite date yet). Place it well away from humid areas, and above all avoid anywhere it’ll be subject to splashing and salt creep. You’ll need to install the CoralCare software — the interface for adjusting parameters and dialling in time points (unless opting for third-party control) which is free from Philips’ website. A USB cable is plugged into the Controller via a five-pin fitting — fiddly, but once in, it doesn’t need to be removed. Plug the Controller into the computer’s USB slot, install the driver for the controller (‘CoralCare Virtual Com’), and you’re set. The interface is a cinch to use; you can set the current time, which is then stored in the Controller, and get playing with the parameters. In all, it’s very intuitive. The luminaire doesn’t need to be connected to the Controller when devising a programme, but if it is, you’ll get real-time feedback on how the settings look, thanks to ‘live mode’, whereby the current colour temperature and intensity are fired up, and ‘demo mode’, which runs through the complete 24-hour light cycle in a couple of minutes . A total of 20 time points can be selected, and within these, points can be selected to the minute so there’s plenty of scope for subtle, granular shifts in parameters. You can assign colour temperature and intensity at each time point by twiddling virtual sliders on the screen. The settings between time points alter smoothly, ramping up or down for natural transitions from sunrise through to sunset and moonlight effects. Hooking up the luminaire involves unscrewing one of the Controller’s end covers and inserting the appropriate wires into the connector blocks. Once the Controller is programmed, the USB can be removed from the computer and plugged into a wall socket using the supplied adaptor. Up to four luminaires can run the same schedule from one Controller, as it outputs four groups of two channels. A useful feature is the ‘task light’, where light of a pre-programmed colour temperature and intensity is activated at the push of a button, overriding the current setting — ideal for spot checks after lights out. Press the button again to return to the programmed setting. The current programme is stored for ever in the event of a power cut, and the time for up to 48 hours thanks to an internal battery. If you’re introducing new corals and temporarily want to dial in a shorter photoperiod or lower intensity, you’ll need to plug the controller back into your computer and alter the settings (or load in a previously saved ‘acclimation’ schedule). Benefits from the software include the ability to download programmes from, and share programmes with, other users, and several prewritten schedules can be downloaded from Philips’ website for tweaking or for use as they are. The Coralcare Controller can be used with 0-10V aquarium control interfaces such as Apex or ProfiLux instead of opting for Philips’ own software. 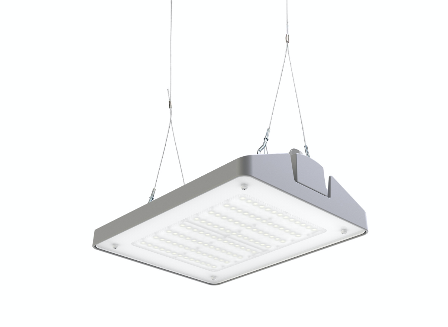 Some may not like its rugged industrial aesthetic, but there’s no denying this is a top-class luminaire. Philips surely deserves a big hat tip for investing in the extensive development involved, and the results from real-world testing suggest it is a viable replacement for T5 lighting. It’s not cheap, but at this level it’s not extortionate either; a great fitting which will last for years with superb quality LEDs. The CoralCare Controller is neat and affordable, and there’s the added potential for third-party control.